Kataru's love and pursuit of Farming: Trees don't care about evapotranspiration.. Trees don't care about evapotranspiration.. True. But we certainly do.. It tells us when and how much to water our farm. We can determine optimum time and amount of water to irrigate the orchard by tracking how much water is lost from the soil via evapotranspiration (the loss of moisture in the soil thru evaporation + the loss of water thru tree transpiration). Let's say you measured soil moisture level at the end of Sunday to be 1 inch. And say, you can only tolerate half-inch depletion. 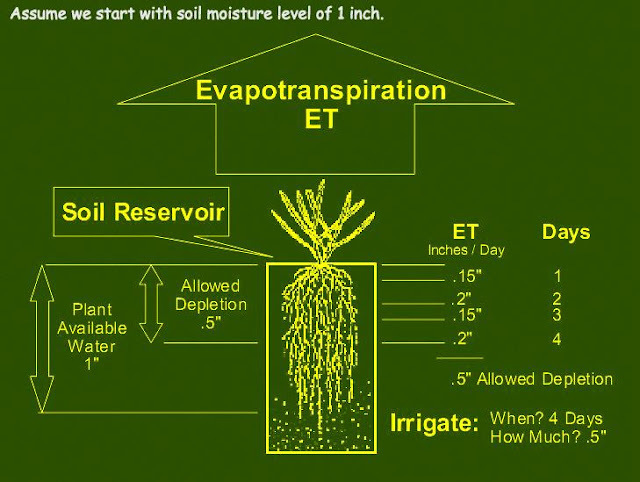 Thurs ET = 0.20 inches --> 0.70'' of top soil is dry --> NOT ok --> IRRIGATE NOW. How do we get daily ET numbers? It's calculated from daily satellite and weather data (temp, humidity, wind) and the type of crop (ground cover) at the farm. I find that different sources provide slightly different numbers. This ET number can be different for different parts of your farm based on soil type differences. Alternative to doing this calculation is to install ground sensors to measure soil moisture up to several feet (like we did at Carpenter ranch). Based on the readings from these sensors, you can make irrigation decisions.